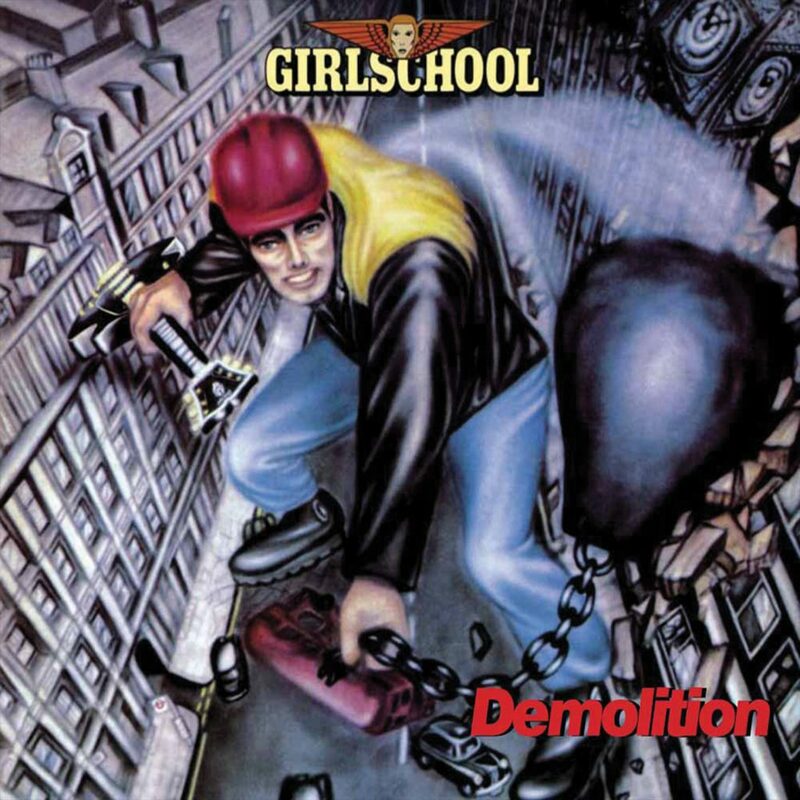 Girlschool’s roots lay in the London-based Painted Lady, but when Kim McAuliffe (rhythm guitar/vocals) and Enid Williams (bass guitar/vocals) hooked up with Kelly Johnson (lead guitar/vocals) and Denise Dufort (drums) in March 1978 things took a change for the better. The largely covers-based sets started to feature more and more original material and the name changed to Girlschool, suggested by their then manager and inspired by the title of the B-side of Wings’ Christmas 1977 No.1 dirge ‘Mull Of Kintyre’. They recorded one 7” single ‘Take It All Away’ for City Records in 1979 but had come to the attention of Motörhead’s manager Douglas Smith and were soon opening for Motörhead on the ‘Overkill’ tour. A deal with Bronze Records, home of Motörhead and, by coincidence, Uriah Heep, one of the Girls’ favourite band, followed. The first fruits of the band’s new deal came on 1 February 1980 with the release of their second single ‘Emergency’ (released the same day as the start of a UK tour supporting the Heepsters). Early signs were encouraging, and in Sounds the single (backed by non-album cut ‘Furniture Fire’) was reviewed alongside Iron Maiden’s EMI debut 7” ‘Running Free’ and copped the better write-up. “It certainly sounds like they have benefited (if that’s the right word) from their tour with Motörhead because this is as good as anything I’ve heard recently from Lemmy & Co., with the added advantage of voices in place of the Black & Decker finishing sander for the vocals. It’s all incredibly corny, of course, but then that’s the whole attraction of heavy metal,” opined Tony Mitchell. It took a while for the album to finally appear, preceded by another 7” ‘Nothing To Lose’ (“super ballsy vocals and lots of cheeky churning lead guitar put ‘Nothing To Lose’ head ‘n’ shoulders above the rest of this week’s heavy rock bundle…” commented Sounds’ Robbi Millar in the singles’ reviews column) but when it did it was certainly a head-turner, and Millar had no hesitation in awarding the LP the full five stars in her glowing review. ‘Demolition’ made its way into the UK album charts, peaking at No.28 during a ten-week run. ‘Demolition’ is an immensely likeable album with not a duff track on display. “They’re no great musicians but they can certainly play,” noted Millar in an earlier piece on the band; “the actual songs are along a straighter heavy metal rock formula though the feminine side is given an obvious airing in the lyrics. ‘Not For Sale’ points out the way that general product advertising uses women in a degrading manner (the parallel between a shiny car and a shiny woman) while ‘Baby Doll’ pokes fun at the American beauty contest meat market.” Also writing in Sounds, Pete Makowski clocked the band in France where they played “a dazzling set which included a spectacular version of that old Gun hit ‘Race With The Devil’ featuring some fast lead work from Kelly who has all the chops and movements of an up and coming guitar heroine.” It came as little surprise that the album’s one cover version was chosen to be the last 7” to be culled from it, but it was perhaps a little unexpected for the 45 (flipped by another album track, a reworking of ‘Take It All Away’) to break into the UK Top 50 and give the band their first hit single. 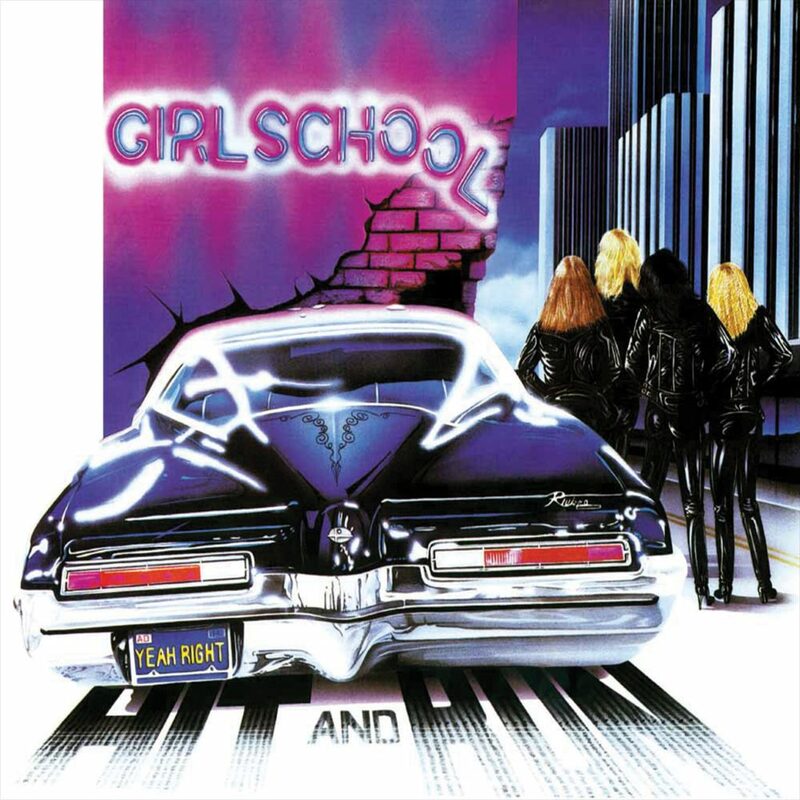 Girlschool’s primary attractions were that they were wholly unpretentious and they worked extremely hard, clocking up numerous gigs in 1980. Recognising their potential Bronze had them off the road and back in the studio before the year was out, and their second album ‘Hit And Run’ appeared in the shops just ten months after its predecessor. Although ‘Demolition’ would go on to be overshadowed by its little sister (which would become their best-selling album and hit No.5 in the UK chart) it’s still pretty much a perfect album and an impeccable introduction to one of Britain’s best-loved and enduring metal institutions.